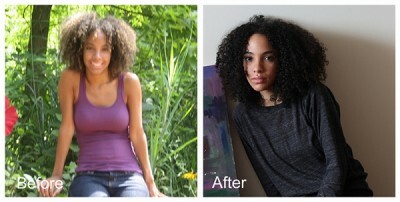 Hello ladies I wanted to share with you how taking care of my hair made a difference in the over all health of it. As you see in the above pictures my hair looks quite different.The before pic shows when my hair was dry, damaged, and breaking off. The after pic shows my hair fuller, longer, and shinier. I never grew up knowing how to take care of my hair, and in my bio I touch on how my mom did the best she could. I didn’t start taking care of my hair until over a year ago. Now previous to that when I was in grad school I had an old friend who did a big chop and went on this total natural hair journey. During her journey she told me about all the things she was trying and using, making suggestions to me along the way. It sounded very overwhelming and I absolutely had no time to do my own research and give my hair the TLC it needed. So after grad school I delved into the world of natural hair, looking at blogs and researching all I could. I loved finding out about all the oils and tings, and looking at hair journeys from so many different women. Thus began my own journey. I swear by deep conditioning/hot oil treatments, moisturizing my hair after a wash with a good cream and sealing my ends with oils or a butter. These simple steps have allowed me to see less shedding, less breakage, and healthier hair. When did you learn to start taking care of your hair? Has it made a difference in its over all health? « Urban Bush Babe: Who’s That Girl? » Would You Date….? I learned in college the importance of deep conditioning and my hair has thanked me. I also learned to pay attention to it. If a product makes it feel dry, stop using it. Since I started taking care of my hair it is longer and healthier. I definitely like your after picture. I like your natural color better. I’m still learning to take care of my hair, tweaking things in my regimen. My hair retains length very well in its natural state but it has been damaged by relaxers in the past. But my hair is getting stronger back in its natural state. I have to agree with you, Nikisha’s natural hair color is way prettier than the blonde hair! Nikisha you look fabulous just the way God made you! You’re welcome, Nikisha! I’m just keeping it real with you! Thanks for sharing this. I’m surprised at the difference in your hair now compared to how it was then. I started taking better care of my hair back in 2007 when I was on hair forums all the time. I slacked off and am fully on the band wagon now that I’m transitioning. My hair is much healthier now as a result. I started taking care of my hair when I had really bad breakage that would not stop unlike in the past when my hair would bounce back. i tried so many products, I became a product junkie, I was using any product that read on the front label for breakage and to grow hair. My supervisor at work turn me onto a hair forum and then I learnt about moisturizing and sealing, once I started doing that every day and tieing a scarf to bed, I started seeing a difference, my hair was no longer dry and brittle and the breakage stopped. Soon people were telling me that my hair grew longer, lol I didn’t even notice the increase in length. I was still in awe of how healthy my hair was. I think this past month has been a breakthrough. Casting away what I think I should do and listening to what my hair and scalp want me to do. I think I should cowash, my scalp tells me to shampoo, my hair says keep that shampoo mild, lol. And that is what i’m figuring out. A new product won’t help the problem if i’m ignoring it or don’t know what it is! Try alternating @4edeaff3536a4888dd6d755ea6aada8e:disqus . Like cowash one week and then shampoo the other. I’m trying that now myself, especially with the warmer weather. I’m not really sure… I started (and stopped) perming my hair when I was 13. But even before that I was always conscious of my hair’s health. The official “Quest for Length” I would say started about 7 months ago. Bright Side: My hair hadn’t been breaking at all until recently, and it seems A LOT thicker. Not so bright side: My hair seems a lot more delicate than it used to be. Roller setting, curlforming, and blow-outs, all seem to pitch my hair RIGHT into breakage city. And (lately) the ends always seem to be dry. Thanks for sharing. Your hair literally looks like 2 completely different head of hair. My hair has also made a marked turn around since I stopped relaxing and started paying attention to keeping my scalp healthy (I had serious scalp issues before). It was long when relaxed, but now it has gotten thicker too. Your welcome @google-19d49e3b6225e954cbf2205af37613e8:disqus :). My hair was different, its crazy because when I wasn’t taking care of it I would say to myself and my friends that my hair was so different when I was younger and wasn’t manipulating it with heat, dyes, and bleach. So i knew something was wrong. I finally figured it out I still have some ways to go in order for me to get it similar to the state of my younger years. I decided to start taking care of my hair after I realized it was getting shorter, and shorter because of me flat ironing, on top of hair dye, and on top of a relaxer. I mean, it was reaching the length of my chin (though it would never grow longer than collar bone length — I didn’t want chin length hair). This did not lead me to go natural, because I was going through emotional things, and I was just going to cut my hair, relax it, and get a pixie cut! I didn’t know why I was trying to hold onto relaxers, because they’re so damaging, and I wanted to cut it into a pixie, that requires even more flat ironing! Glad I didn’t go down that route. I just knew I was going to cut it either way. I decided to go natural/take care of my hair, when one of my friends suggested it to me (going natural), my own mother is natural, lol (sisterlocs). After I did my own research, through YouTube and blogs, I realized I could have this big huge curly hair (not being specific to a hair type, I didn’t really care, I just wanted big hair, lol!) of my own. I’m glad I had a bit of research under my belt prior to my BC and going natural. My hair would probably look completely different if I hadn’t. Now with your site, and others, I’m learning how to grow it out from 5″-6″ and taking care of it along the way; keeping it shiny and all that jazz, the natural way! Woo-hoo! Healthy hair, here I come. Our hair is so much alike! I look like your before picture right now blonde hair, same texture and all, it’s not dry all the time tho only after a few days! I was wondering if you cut your hair first before starting to grow it and conditioning and nuturing your ends? Or did you just start as is? Hey, it’s really looking just great view. The after picture is really looking just fantastic than before. I am highly impressed to your hair style. And your hair type is also looking just elegant. The regarding information of this post really drives me on the most craziest way about it. Thanks for sharing. For years I had my hair in two strand twists but my hair never grew past the nose/eye level. Once in a while I would trim the crispy ends of my twists and wonder why my hair never grew whilst my sister had shoulder length hair. People would always compliment me on my hair and it did look and feel nice, I just never retained length. Now that I have discovered YouTube and natural hair webpages I have made some major changes to my hair routine and I am finally retaining length. I have not had to trim my hair since Jan 2011 when I changed my hair routine and now I have discovered protective styles (my sister always wears her hair in these we just didn’t realise they were good for your hair) the front of my hair has reached the dip below my bottom lip. Knowing how to properly take care of your hair really does make a difference. you and hopping for some more informative posts. Here we have some tips on choosing right color for hair dye. If you know how to choose the right color you can experiment with your hair, yet looking stunning and gorgeous. That’s very perfect changes that I was able to see on your hair compare from your natural hairstyle. Taking good care of your hair could really turn your hair to a biggest changes that can bring you to have maximum hair protection. When making the prudent choice of investing in long lasting virgin hair extension, it is of equal importance to invest in a ceramic flat iron that will diminish any damage to your natural hair and your hair integration as well.